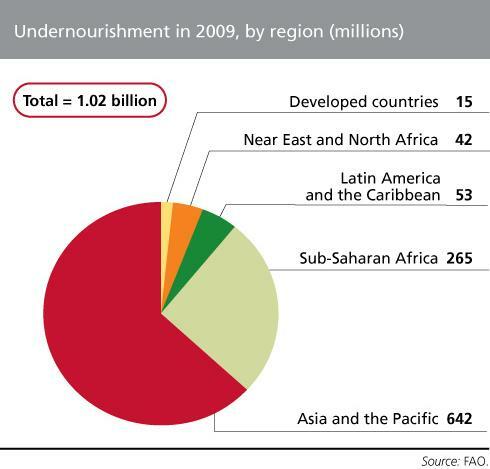 There are an estimated 1.2 Billion undernourished people in the world today. That means one in six people do not get enough food to be healthy and lead an active life. Hunger and malnutrition are in fact the number one risk to the health worldwide — greater than AIDS, malaria and tuberculosis combined. Abundance, not scarcity, best describes the world's food supply. Enough wheat, rice and other grains are produced to provide every human being with 3,500 calories a day. That doesn't even count many other commonly eaten foods-vegetables, beans, nuts, root crops, fruits, grass-fed meats, and fish. Enough food is available to provide at least 4.3 pounds of food per person a day worldwide: two and half pounds of grain, beans and nuts, about a pound of fruits and vegetables, and nearly another pound of meat, milk and eggs-enough to make most people fat! The problem is that many people are too poor to buy readily available food. Food is always available for those who can afford it—starvation during hard times hits only the poorest. Millions live on the brink of disaster in south Asia, Africa and elsewhere, because they are deprived of land by a powerful few, trapped in the unremitting grip of debt, or miserably paid. Underweight: measured by comparing the weight-for-age of a child with a reference population of well nourished and healthy children. Undernutrition contributes to 53 percent of the 9.7 million deaths of children under five each year in developing countries. This means that one child dies every six seconds from malnutrition and related causes. Iron deficiency is the most prevalent form of malnutrition worldwide, affecting an estimated 2 billion people.6 Eradicating iron deficiency can improve national productivity levels by as much as 20 percent. Vitamin A deficiency affects approximately 25 percent of the developing world’s pre-schoolers. It is associated with blindness, susceptibility to disease and higher mortality rates. It leads to the death of approximately 1-3 million children each year. There is enough food in the world to feed everyone. Yet, malnutrition and hunger still afflict one out of every seven people on earth. Why does hunger exist? Natural disasters such as floods, tropical storms and long periods of drought are on the increase -- with calamitous consequences for food security in poor, developing countries. Drought is now the single most common cause of food shortages in the world. In 2006, recurrent drought caused crop failures and heavy livestock losses in parts of Ethiopia, Somalia and Kenya. In many countries, climate change is exacerbating already adverse natural conditions. For example, poor farmers in Ethiopia or Guatemala traditionally deal with rain failure by selling off livestock to cover their losses and pay for food. But successive years of drought, increasingly common in the Horn of Africa and Central America, are exhausting their resources. Since 1992, the proportion of short and long-term food crises that can be attributed to human causes has more than doubled, rising from 15 percent to more than 35 percent. All too often, these emergencies are triggered by conflict. From Asia to Africa to Latin America, fighting displaces millions of people from their homes, leading to some of the world's worst hunger emergencies. Since 2004, conflict in the Darfur region of Sudan has uprooted more than a million people, precipitating a major food crisis -- in an area that had generally enjoyed good rains and crops. When conflict threw Central Africa into confusion in the 1990s, the proportion of hungry people rose from 53 percent to 58 percent. 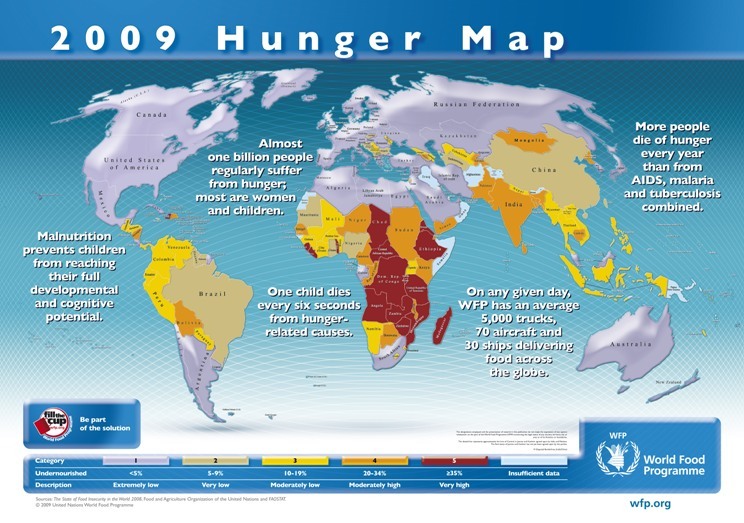 By comparision, malnutrition is on the retreat in more peaceful parts of Africa such as Ghana and Malawi. The poverty-stricken do not have enough money to buy or produce enough food for themselves and their families. In turn, they tend to be weaker and cannot produce enough to buy more food. In short, the poor are hungry and their hunger traps them in poverty. According to the Food and Agriculture Organization (FAO) 2004 Food Insecurity Report, all the countries that are on track to reach the first Millennium Development Goal have something in common -- significantly better than average agricultural growth. Yet too many developing countries lack key agricultural infrastructure, such as enough roads, warehouses and irrigation. The results are high transport costs, lack of storage facilities and unreliable water supplies. But, although the majority of developing countries depend on agriculture, their governments economic planning often emphasises urban development. Poor farming practices, deforestation, overcropping and overgrazing are exhausting the Earth's fertility and spreading the roots of hunger. Increasingly, the world's fertile farmland is under threat from erosion, salination and desertification. Making farming more productive so that there will be more food for the world’s growing population.